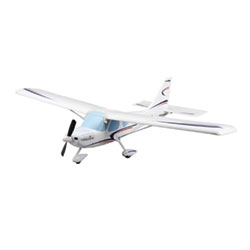 The HobbyZone® Glasair® Sportsman® airplane is a 4-channel model that anyone can learn to fly. Even if you've never been at the controls of an RC model before, smooth control and assistance provided by its sophisticated electronics make RC flight simple and fun. Champion pilot Mike McConville designed the Glasair Sportsman model to be beginner-friendly, which means it's extra tough so that you can keep flying longer. Plus, it is loaded with other great features that make it an outstanding first plane. Wing leveling gently returns the wings to level when the aileron stick is released. If you become confused while flying, release the sticks and the aircraft will return to level flight. Electronic 2-axis damping moderates the effect of wind turbulence and provides stability in most flight maneuvers so that it is easier to fly through wind gusts. Bank limiting prevents the aircraft from entering a spiral by decreasing control input automatically, even if you become confused and hold the wrong turn input. Active mixing responds to your aileron stick movements and automatically gives proper rudder and elevator inputs to make turns smooth and coordinated.